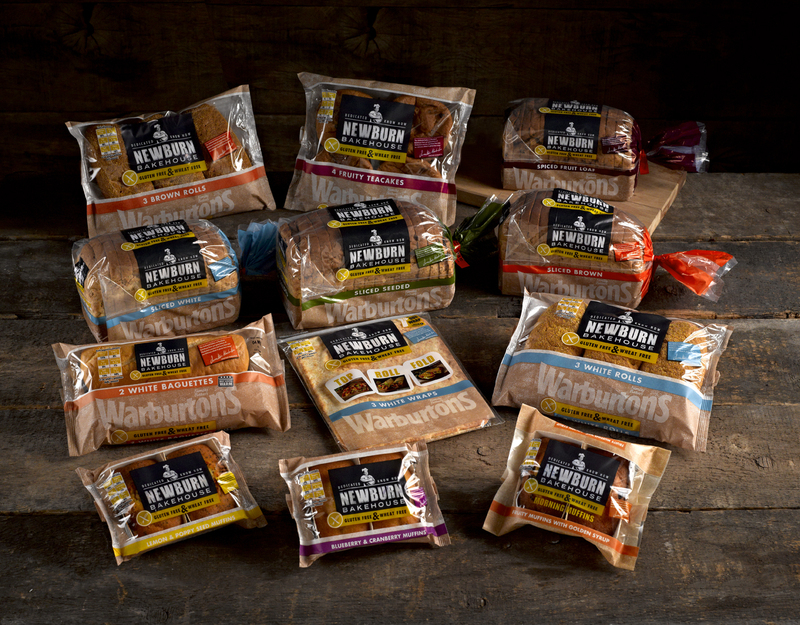 Yesterday, Warburton's gluten free bakery, Newburn Bakehouse, launched four new products. Baguettes, fruity muffins, a seeded loaf and (drum roll, please) wraps. That's right, the much longed-for and oft-fantasised wrap is now a gluten free reality! Or, at least, it's on a trial basis. These limited edition 3-packs of square, gluten free wraps are available in selected Tesco stores for you to buy and try. 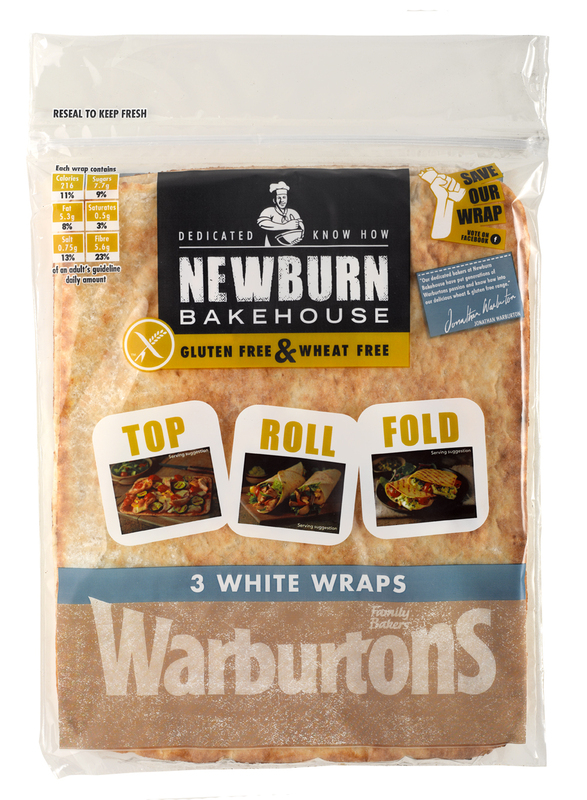 If you like them and want Warburton's to keep making them, you can vote to "Save Our Wrap' on Facebook or Twitter (using the hashtag #saveourwraps). Sadly, there isn't a single stockist of the wraps within a thirty mile radius of my home, so it was fortunate that Newburn Bakehouse sent me one to try. If you want to find out where you can buy yours, head over to the Newburn Bakehouse website and enter your postcode. The rest of the new products are more widely available, so even if you can't find the wraps you will be able to buy the baguettes, seeded loaf and fruity muffins at a variety of stockists. The addition to the range that's excited me most of all is the baguettes. Warmed in the oven, they're soft and fluffy on the inside with a crisp crust, just like my memory of french bread. You can eat them straight from the packet, they're still soft, but the crust is soft (and a little bit squeaky). Suddenly bruschetta, crostini and garlic bread are back on the menu. It's £2.29 for a pack of two baguettes, which I think is quite reasonable. The seeded loaf is the same great quality as the other Newburn breads so it's soft, not crumbly and stays fresh for a good few days. As every Coeliac knows, adding fibre to your diet isn't easy and a bread packed with millet, linseed, sunflower and poppy seeds is always a bonus! On the opposite end of the scale, the fruity muffins are packed with golden syrup, so they're deliciously moist and sweet. Probably not a nutritious breakfast, but they're so tasty I think I'd probably justify one for elevenses. I'm very impressed with the new offerings from Warburtons, they seem to have listened to customers and have brought us products that fill a need. How many times have us GF-ers bemoaned the lack of a great sandwich wrap or soft baguette? Well done to Newburn Bakehouse for listening! Great review thank you. As we rarely get to see the new products in the South West its great to hear about them from others. Sadly the muffins and wraps contain dairy so no good for me :( The baguette looks very tempting though. The baguette is my favourite from all the new products, if you can get hold of it it's worth a try. Hopefully the products will be rolled out to more stores if they're popular and the South West (and my immediate area in the SE) will get the chance to buy them, too! I love Newburn product it is very sweet to buy such food items from you. Thanks for making such type of food.